Add the quinoa, water, minced onion, minced garlic and salt in a rice cooker or steamer. Cook like you would cook rice. Once done, leave lid open to cool. (you can also cook this ahead of time and refrigerate until you are ready to saute the vegetables). Quinoa can also be cooked on the stovetop, while covered and simmering, with the same water/quinoa ratios. Heat the olive oil in a saucepan over medium-high heat. Stir in the green onion or onion and carrot, and cook until the carrot is softened a bit and the green onion starts to slightly brown (this adds a nice slightly smoky taste). Add the red pepper, corn, garlic and basil; continue cooking until the pepper softens, about 5 minutes. Season with cumin, salt, and pepper and cayenne (optional). Add the quinoa and cook for 1 minute more or until heated through. Serve hot or cold. I like to cook the quinoa ahead of time and add garlic, minced onion and salt. 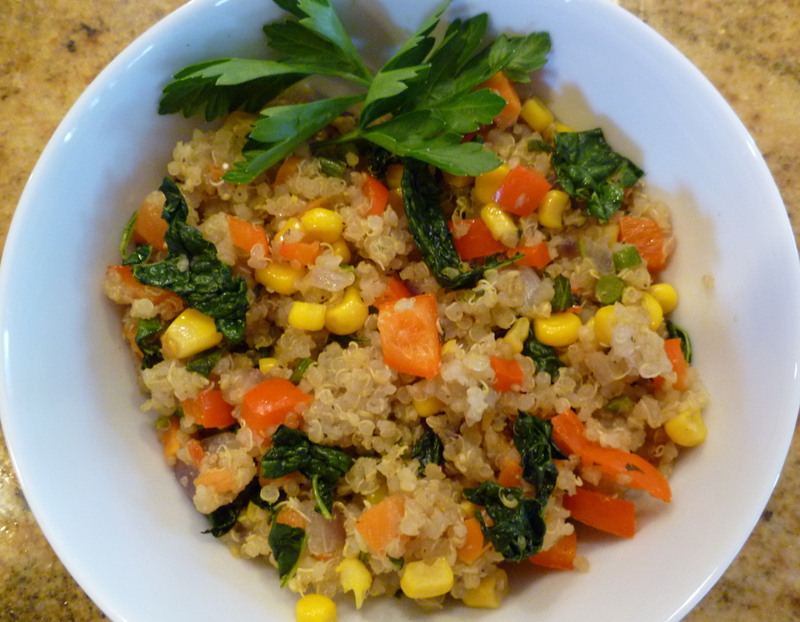 You can cook the quinoa in chicken or vegetable broth for more flavor. I like the quinoa to be cooled down as it will then fluff nicely with a fork and won’t be sticky when you go to add it to the vegetables. When cooking the vegetables, I like to cook the onion or green onion first so I can get it to ever so slightly burn on the edges which gives the whole batch a nice smoky-like flavor. You can make this with ANY veggies on hand. I always use garlic and whatever onion I have; green onion, shallots, red onion… they all work. Then add your favorite veggies and a can of corn… YUM! Fresh basil and cumin REALLY make this flavor. Don’t forget to add them both! You blog some tasty looking recipes. Why thank you so much! Your recipes look scrumptious as well! Can’t wait to try your Pumpkin Sage Bread! oooo….this looks so good….may do this this weekend with my quinoa! This is one of my weekly go-to staples. Make sure to cook the quinoa ahead so it can cool down a bit to be fluffy, not sticky when you add it to the veggie saute. Fresh basil and cumin really add flavor. But my favorite part of this dish is how versatile it is. I don’t think I have ever made it the same twice. I use whatever veggies I have around that I need to use and vary the spices accordingly. Really easy and great the next day warmed up or eaten at room temp. Let me know how you make yours! Well this sounds just perfect, so simple too!